Who is NOT ready to get pinched on March 17? I hate getting pinched and yet, I have very little green in my closet. However, I do still have some green and I will certainly pull it out to wear on St. Patrick's Day. 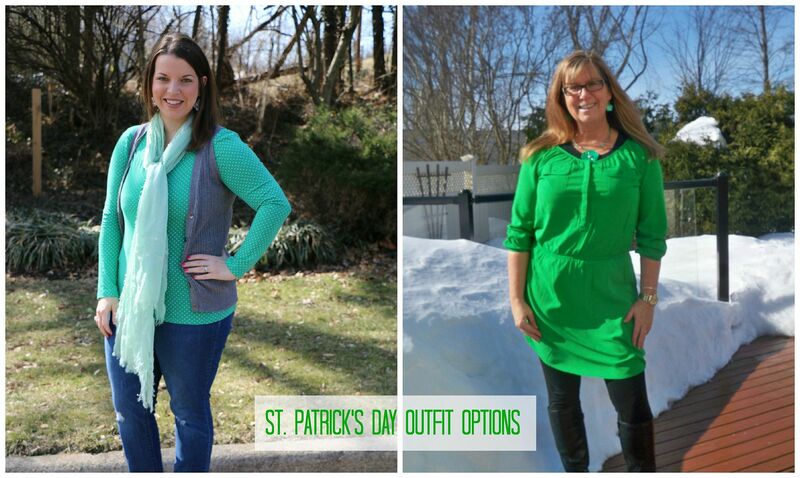 I'm teaming up with Linda from A Labour of Life to bring you ideas on what you can wear for St. Patrick's Day. 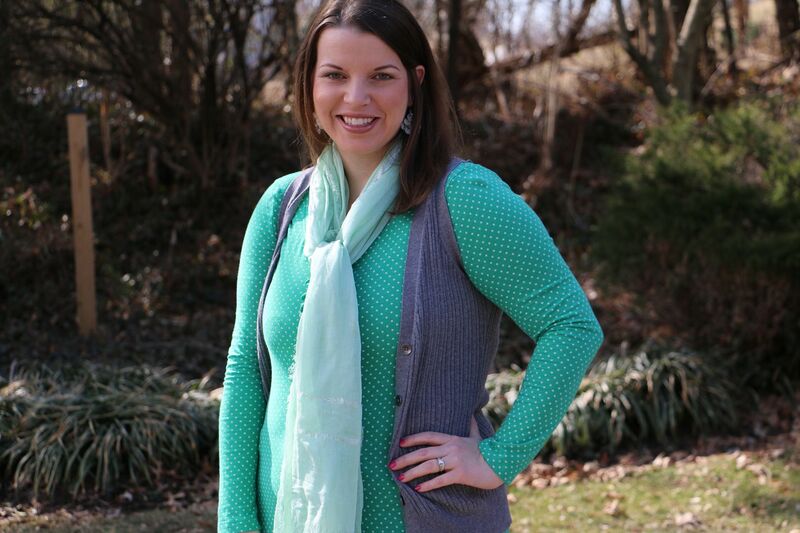 I've had this green polka dotted shirt for a while and actually forgot I owned it until Linda and I were talking about what we could wear for St. Paddy's Day and I was hopeful something green existed in my closet. And to prove that I actually did forget about this shirt, I thought those were dots, but nope, they are actually diamonds. Is polka diamonds a thing? I went for a dressed down St. Paddy's Day look, but you know I still had to have some wedges for height. 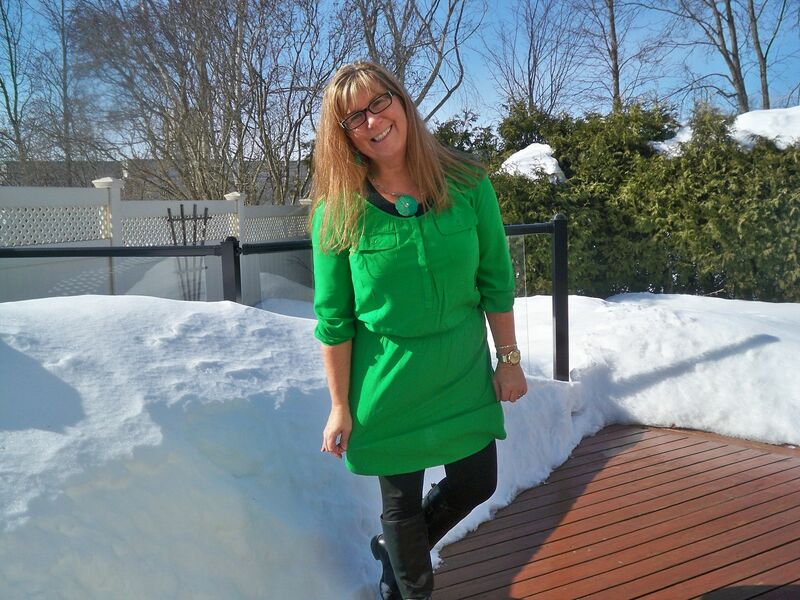 Because I don't have a lot of green, I decided to wear shades of green to really get into the holiday. 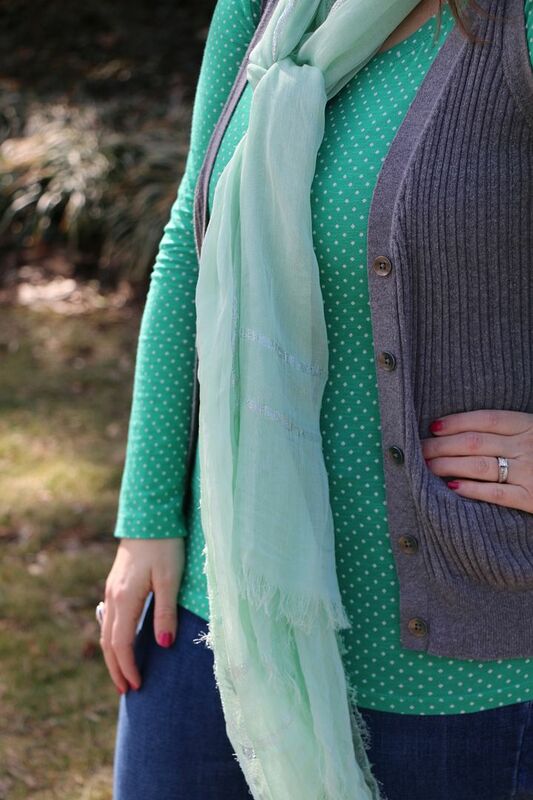 So I added a mint scarf to complete the outfit. Sidenote: check out Subtle Luxury's SPUN scarves. The scarves are so soft and amazing. They have so many color and design options. Plus, Alessandra Ambrosio, Jessica Alba, Hilary Duff and Selena Gomez were all just spotted wearing the scarves. Which means they are super cool, am I right? Jeans and shirt: Old Navy. 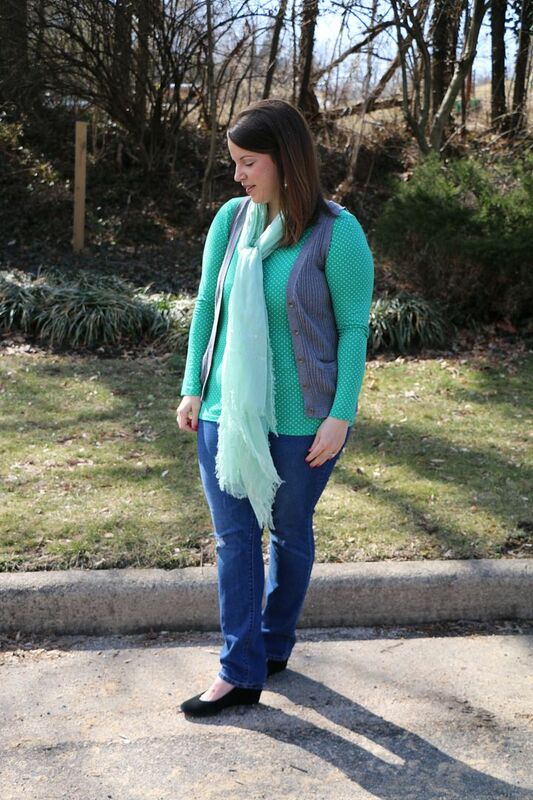 Vest: New York and Company. 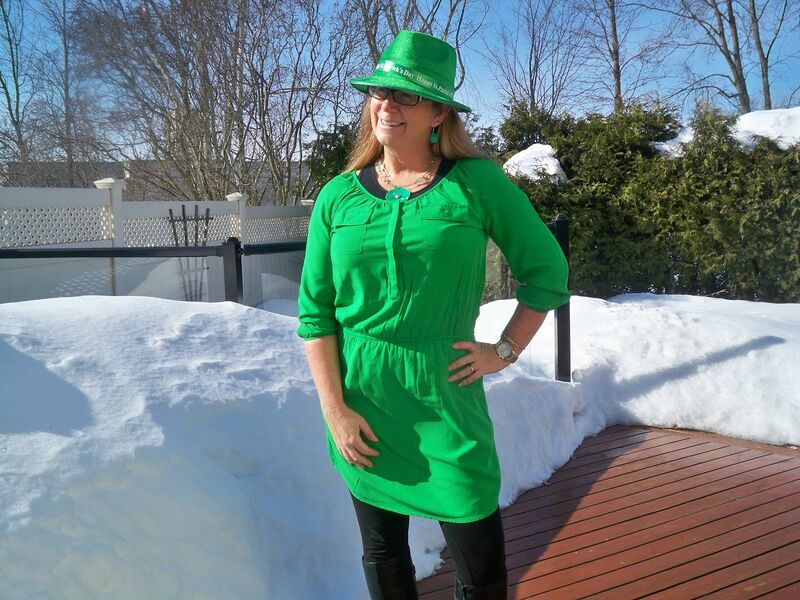 Now Linda maxed it out with her St. Patrick's Day outfit. I adore her green dress, it is the absolute perfect shade of green! So bright and cheerful. I love how she paired the outfit with some black leggings and boots, very seasonally appropriate - just look at all of that snow! However, Linda thinks the dress is way more fun if she doesn't have to wear the leggings and boots. But I'm sure she looks fab either way. 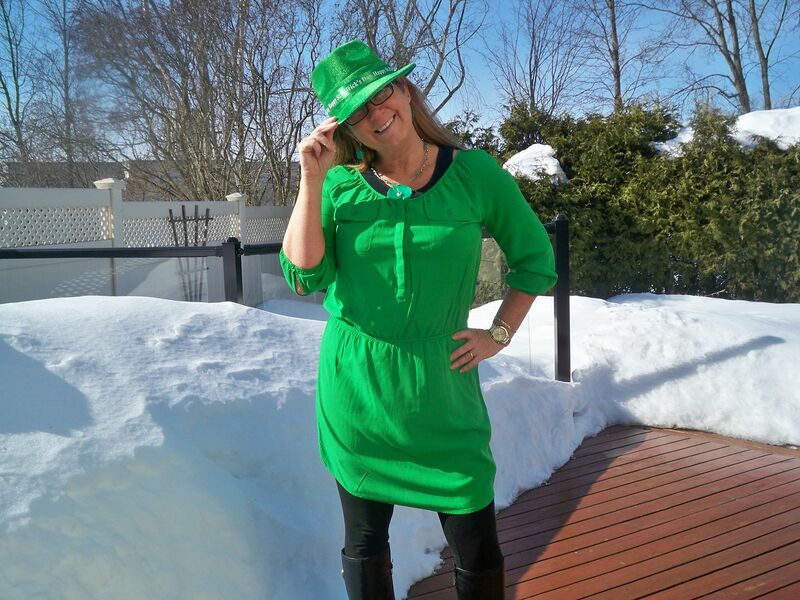 And I love that she really got into the St. Paddy's Day spirit by adding a leprechaun hat. I need to go find me one of those! 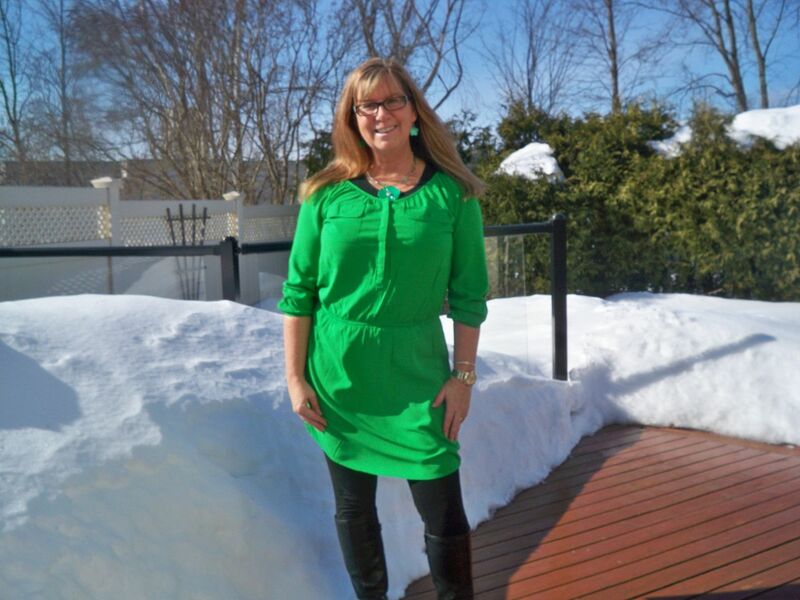 Linda blogs over at A Labour of Life about her travels, her clothes, her love, her life and more! She is a woman after my own heart because she loves Diet Pepsi and has over 100 pairs of shoes! I'm a Pepsi girl too and I wish I had 100 pairs, I'm close though! Just scrolling thru her blog you will see all of her terrific shoes, I have definite shoe envy. She has a great sense of style, just check out her blog for some inspiration - I love the leggings that she wears in this post here. I love that Linda is such an honest blogger and that she can also laugh at herself. 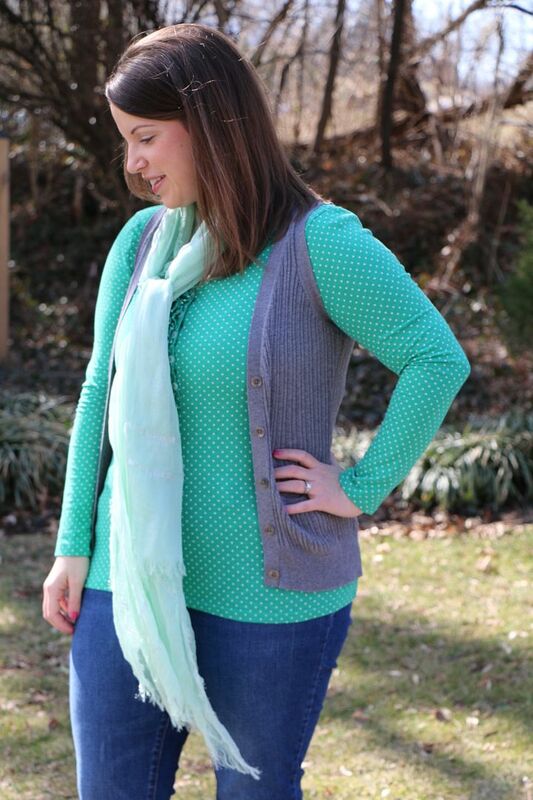 Check out her blogger blooper post. We have all been there; standing awkwardly, making funny faces, hoping for a ton of great pictures of our amazing outfit to only end up with three decent photos. Thanks for making me smile Linda! And to put a smile on your face too, Linda is giving away ad space on her site. You can enter below to win the Full Bodied and Rich spot which features: an individual guest post including up to 5 pictures and the option to host an individual giveaway. She promises some social media love too. To enter, just use the rafflecopter below. 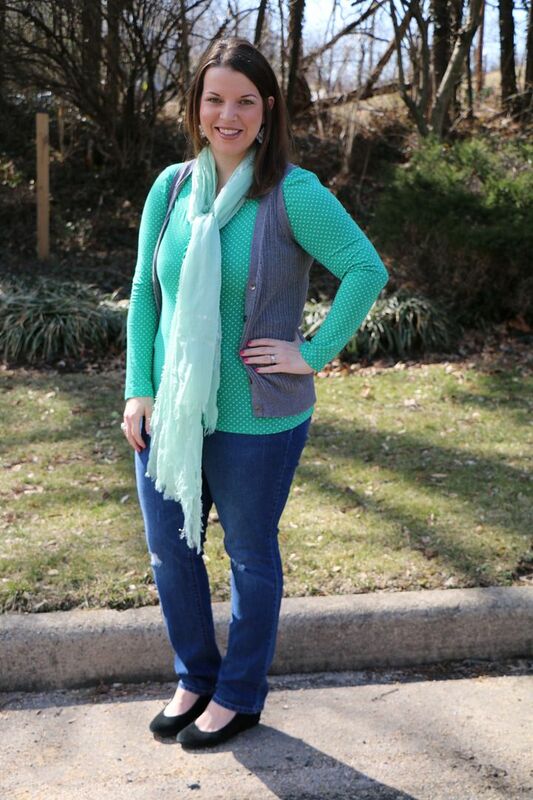 I'm linking up with The Pleated Poppy for What I Wore Wednesday, Because Shanna Said So for Random Wednesday and Style Elixir for Style Sessions. Absolutely impressed by its perfection. I was really impressed by the fine creativity and artistry. I am really looking forward to the coming occasion when I am going to wear it. Love that scarf! You're looking great Lindsay! I love your "polka diamonds"! That top looks so cute paired with the vest. I love both of these outfits!!! Want to Win Some Stuff?